America has the hamburger, Italy has pizza, England has fish and chips and Japan has sushi; Thailand has som tam. 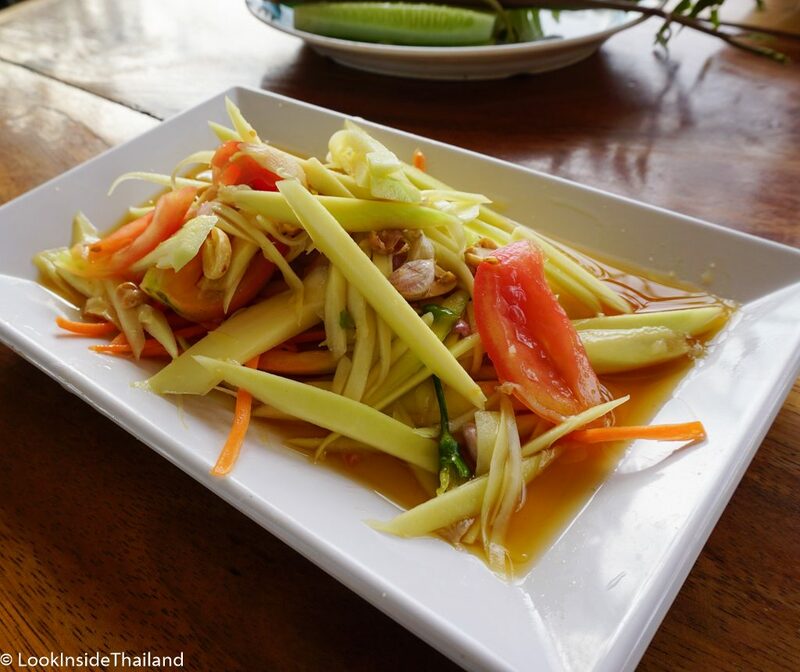 Unique, delicious, and spicy, this papaya salad is something that you must try when you come to Thailand. Som tam translates from Thai to English as “sour pounded”. It is a Thai dish that is from the Isaan region, located northeast of Bangkok where my family comes from. Som tam is a Thai dish I have been eating from the time I was a child and my is my favorite thing to eat! Want to make your own som tam? 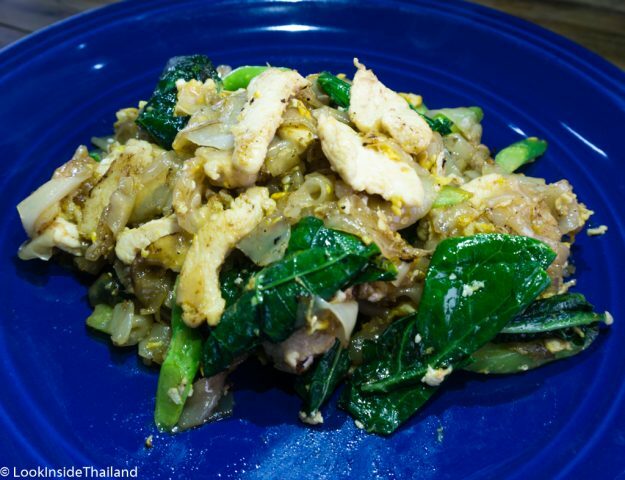 Be sure to check out the som tam recipe page. What are Ingredients in the som tam? Som tam is made from shredded unripe papaya, mixed with Thai chilies (of course! ), garlic, fish sauce, palm sugar, tomatoes, peanuts, sun dried shrimp, carrots, green beans, tamarind juice, and lime juice Using a wooden or clay mortar and a wood pestle, they mash and mix the ingredients to unlock the flavors and smells. The heat comes from hot chilies, called phrik kee nuu, these are tiny super-hot green or red Thai chilies. Street food vendors will always ask how many chilies to add to your som tam. Be careful here. The smashing of fresh chilies coats the salad with spicy oils that we Thais love, but foreigners are not comfortable with. Try one or two chilies first, it can take years to build your strength to handle five or six fresh phrik kee nuu! Isaan people will not say it’s delicious unless it has ten chilies, sometimes more! PRO TIP: As one of the spiciest dishes in Thailand, it’s important to be careful when eating som tam. To get the number of chilies you want when ordering, say “phrik med” (chili pieces) and hold up a number on your fingers to tell the cook how many chilies you want. Why is som tam Thai delicious? Som tam Thai – garlic is smashed and added for a great SMELL. Cherry tomatoes, peanuts, carrots, and pieces of long bean are added for taste and texture. Lime juice and tamarind juice are used for the SOUR taste of the som tam sauce. Palm sugar for the SWEET taste. Fish sauce for the SALTY flavor. My mouth is starting to water now! I believe the mixture of all these flavors is an over load for the taste buds and the spiciness gets the blood flowing and starts your mouth watering making it a really great eating experience. Every day, street food vendors will slice the papaya by hand with a large sharp knife. They will make long cuts, very fast, into the papaya and then slice down, creating the long thin green strips in a big pile for their customers. 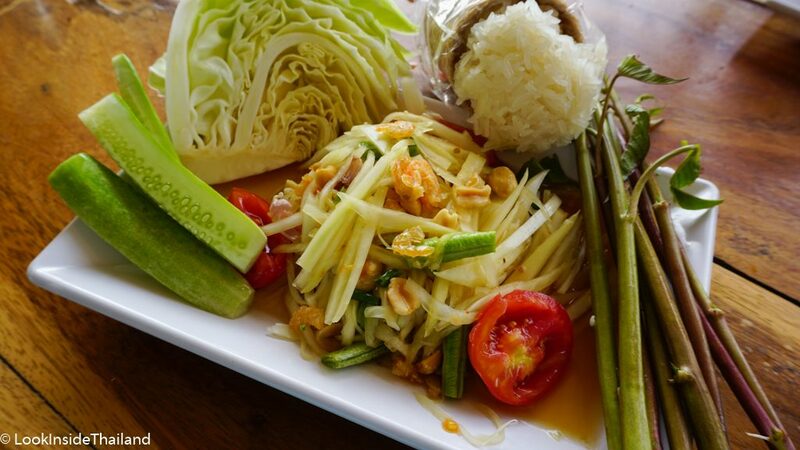 Part of the deliciousness of som tam or Thai food, in general, is the freshness of the ingredients. 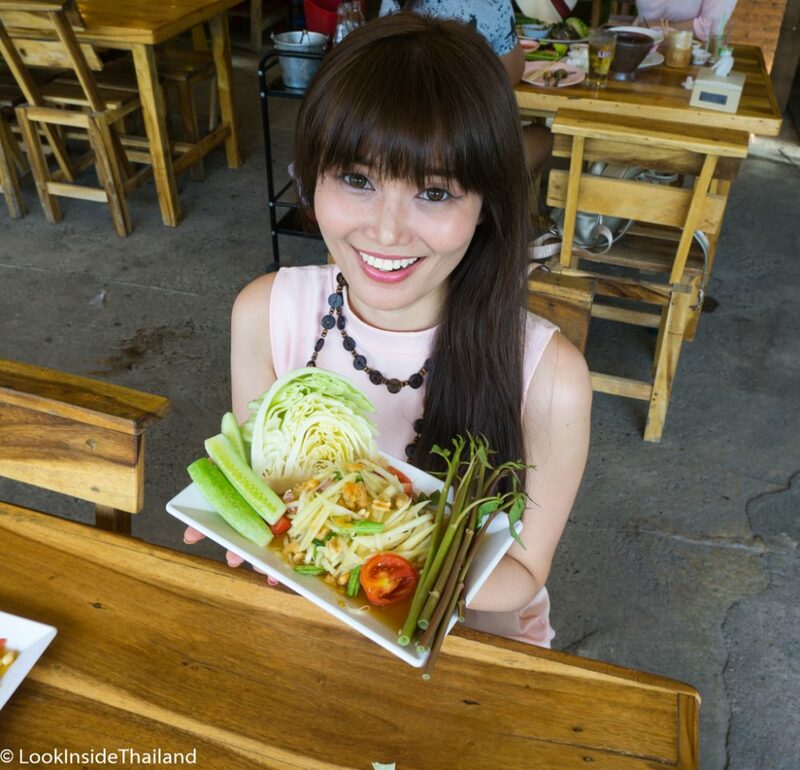 Why eat sticky rice with papaya salad? Sticky rice, or khao neo, is a soft glutinous rice, that is cooked in a special way in order to make it extra sticky. 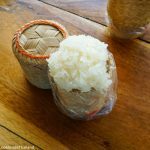 The sticky rice is perfect for dipping in the som tam sauce. Take a bite-sized amount in your hand and roll into a ball. Dip it into the juice on the plate and eat. The rice is semi-sweet and the sour and salty taste of the sauce with the texture of the rice is so good! What are these crabs for? 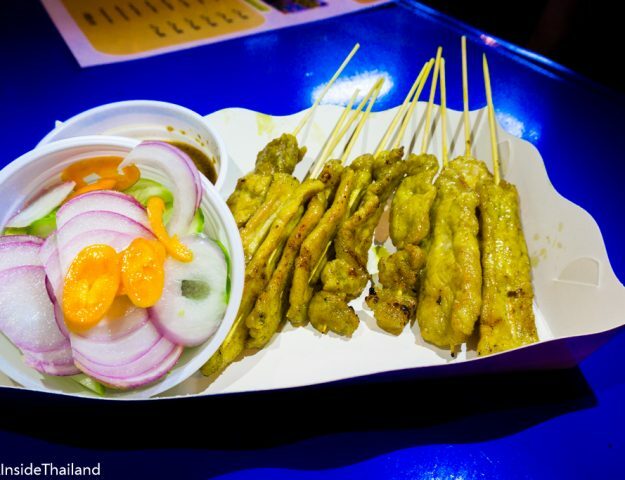 The different areas in Thailand have added their own personality to this special dish. 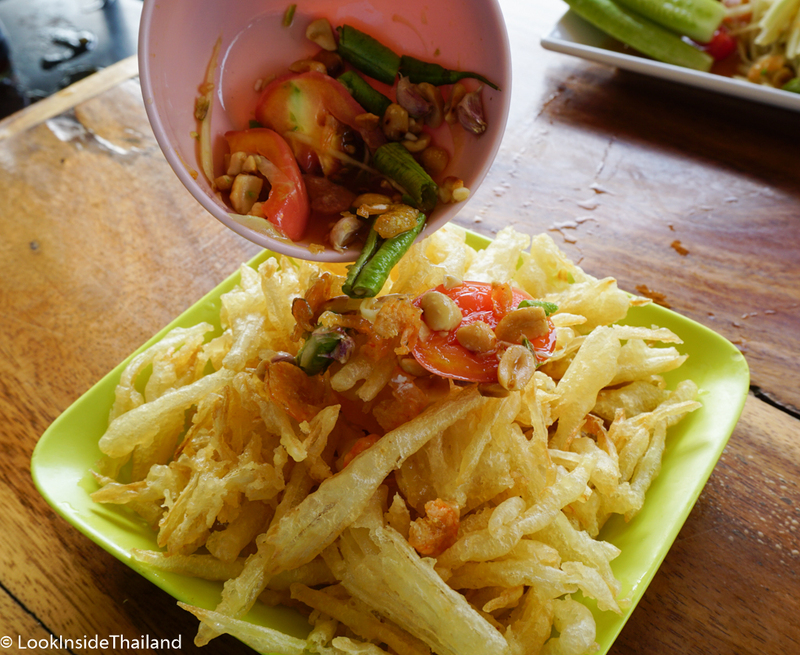 The Central region, Bangkok, will have dried shrimp and peanuts only, this is called som tam Thai. The areas along the coast will use raw ocean crab, called poo ma, it’s very tasty! 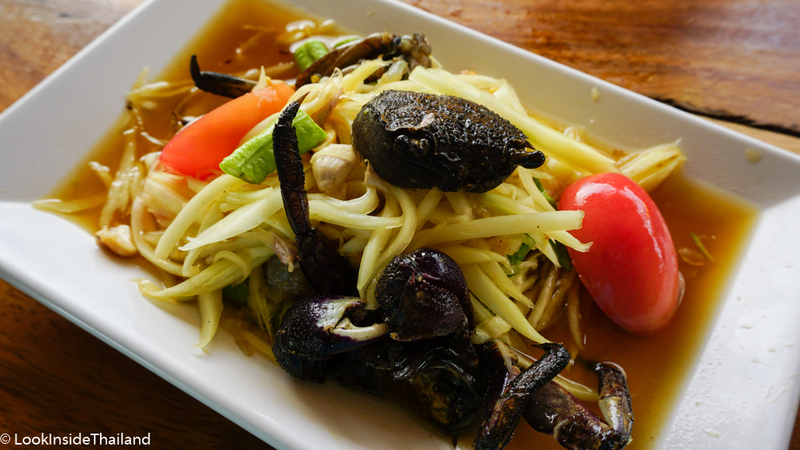 The Isaan region will add a small, black crab from rice field called poo dum. 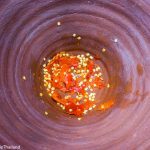 But most Thais love the som tam poo plaa raa, which comes from Isaan, Plaa raa is a salt and freshwater fish mixture that is fermented with ground roasted rice added to it. I love it! But it’s an acquired taste, of course. Wait, you can deep fried som tam? Som tam tod is a kind of papaya salad that you’re only going to find at sit-down Thai restaurants. 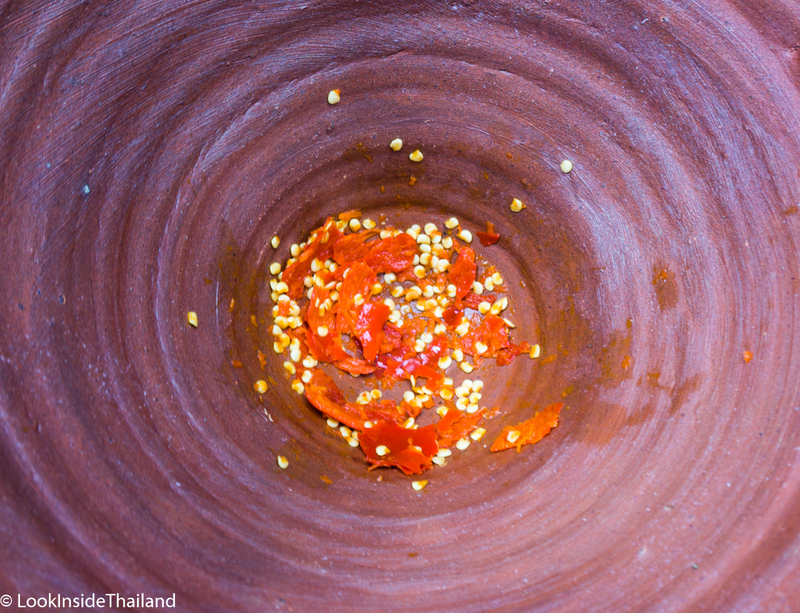 With som tam tod, instead of mashing together all the ingredients in the mortar, the papaya is kept separate. The rest of the ingredients are mashed together in the mortar, while the papaya is battered and fried in oil. Creating a dish that tastes like french fried som tam, the sour mash of som tam juice is poured on top of the papaya to create a crispy fried salad absolutely popping with flavor. 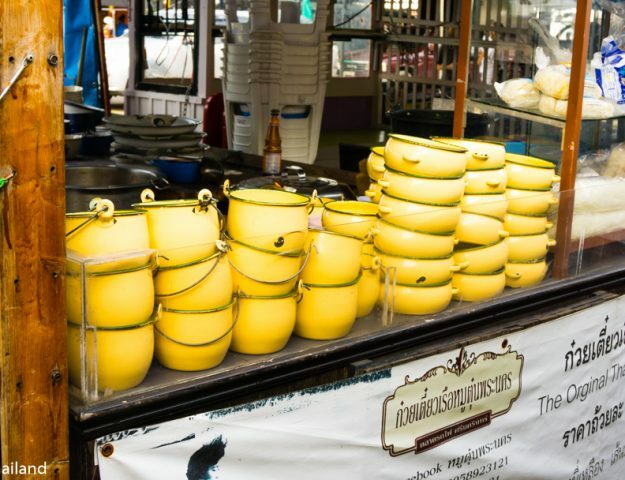 It is harder to make than regular som tam, street vendors usually won’t have this delicious item on their menu. If you see it on a menu, be sure to get some! What if I don’t like papaya? It is NOT only green Papaya for som tam, we also can use green Mango, Carrot, Cucumber, and Long Green bean making it almost as delicious as papaya! How to order som tam? To order the different varieties of som tam ask for : “som tam Thai” (regular), “som tam poo” (fermented crab), “som tam plaa raa” (fermented fish), “som tam poo plaa raa” (fermented crab and fermented fish), “som tam poo ma” (fresh ocean crab/ cooked ocean crab), or “som tam tod” (deep fried som tam). For your first taste of som tam, I recommend som tam Thai with two to four chilies, and for children som tam with no chili. Want to make your own som tam? Be sure to check out my som tam recipe page! Lets get out there and have some som tam! !